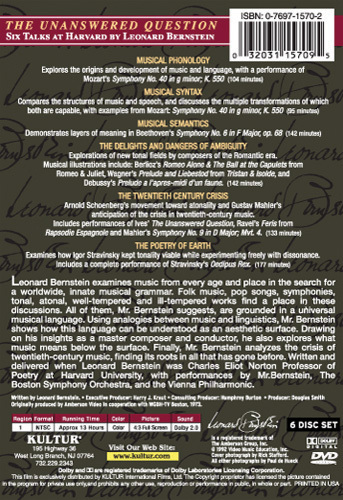 Leonard Bernstein examines music from every age and place in the search for a worldwide, innate musical grammar. ; Folk music, pop songs, symphonies, tonal, atonal, well-tempered and ill-tempered works find a place in these discussions. ; All of them, Mr. Bernstein suggests, are grounded in a universal musical language. Using analogies between music and linguistics, Mr. Bernstein shows how this language can be understood as an aesthetic surface. ; Drawing on his insights as a master composer and conductor, he also explores what music means below the surface. Finally, Mr. Bernstein analyzes the crisis of twentieth-century music, finding its roots in all that has gone before. 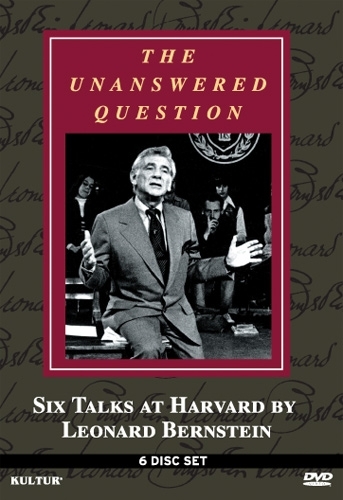 Written and delivered when Leonard Bernstein was Charles Eliot Norton Professor of Poetry at Harvard University, with performances by Mr. Bernstein, The Boston Symphony Orchestra, and the Vienna Philharmonic. This is a 6 DVD Set! In this series Bernstein, puts forth a theory of musical semantics (a theory of musical meaning), borrowing techniques from the linguistic of Noam Chomsky. People, especially intellectuals, with little or no musical background will probably find this fascinating. Bernstein does a remarkable job of explaining the basics of music theory, giving examples on the piano as well as from recordings. He also uses examples from poetry, comparing stylistic historical changes in literature with those in music. As philosophy of music, although interesting and worth consideration, Bernstein's views don't hold up (his criteria don't meet all of the jointly necessary sufficient conditions for something to be a language). As a lecturer, Berstein is utterly charming, and, I think anyone will agree, one of the greatest lecturers of the 20th century.